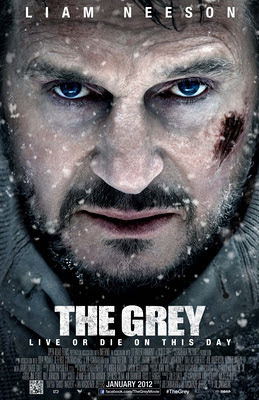 The Grey (recommended): This thriller essentially functions as a vehicle for Liam Neeson to be awesome as his oil rig worker and companions are chased through the snowy Alaskan wilderness by wolves following a plane crash. It’s a lot of fun, and quite a stressful experience. Now playing in wide release. Read my review from yesterday. Albert Nobbs (mixed bag): This Oscar-nominated film features a calculated performance by Glenn Close and a humorous one from Janet McTeer, but the film itself isn’t quite certain what tone it wants to take and suffers as a result. It’s worthwhile from the performances, but that’s about it. Now playing in limited release. Read my review from its December Oscar-qualifying release. Happy, Happy (highly recommended): This Norwegian entry for Best Foreign Film is a fascinating and rich tale of two couples living in adjacent homes whose interactions are less than honest and sincere. It’s a great foreign small-ensemble drama, and definitely recommended for anyone that doesn’t mind subtitles. 50/50 (recommended): This Golden Globe Best Picture nominee is a sometimes funny, sometimes serious film about dealing with a diagnosis. Joseph Gordon-Levitt got a Globe nod for Best Actor, but Seth Rogen, Bryce Dallas Howard, and especially Anna Kendrick are terrific as well in this rich and enjoyable dramedy. Babel (mixed bag): I wasn’t overly fond of this multilingual 2006 Best Picture nominee, but it’s probably worth a look. Billy Madison (mixed bag): This is nowhere near my favorite Adam Sandler film, but I know it has its fans. In the Mood for Love (recommended): This Wong Kar Wai film was one of the first films I watched in my freshman year Intro to Cinema Studies course. Even though it may not be a typical narrative, it’s fascinating in its own right. Margot at the Wedding (mixed bag): This Noah Baumbach follow-up to “The Squid and the Whale” (he’s since done “Greenberg”) was depressing and without any sort of air of positivity, intriguing but ultimately off-putting. 1984 (recommended): This film adaptation of the classic novel was actually released in 1984, and it’s a strong cinematic realization of a dystopian story. One Flew Over the Cuckoo’s Nest (highly recommended): This 1975 Best Picture winner is considered to be one of the best films in recent decades, and it definitely is. Jack Nicholson is at his best, and look out for young actors like Christopher Lloyd, Brad Dourif, and Danny DeVito in the cast as well. Primal Fear (mixed bag): Though its plot isn’t as strong as it should be and the others actors can’t compare, there’s no denying Edward Norton’s brilliance in his first feature film role as nervous altar boy Aaron. It’s a riveting performance. Revenge of the Electric Car (recommended): This follow-up to 2006's "Who Killed the Electric Car" spotlights four different producers of electric cars as they battle to forge ahead and help change the way the automobile industry works. It's an energizing, engaging film with an invigorating narrative and smart editing. Serenity (highly recommended): This sequel to the beloved “Firefly” TV series is a must-see film for any fan, and it’s actually considerably more frightening and thrilling than I had expected. Definitely required viewing. Shane (recommended): This 1953 Western is one of the classics, and it’s definitely a typical 1950s Western, featuring two main characters and a great hero-villain story. Sky Captain and the World of Tomorrow (mixed bag): This was among the less memorable of the six movies in which Jude Law appeared in 2004, aiming for styled homage and coming up a bit short. The Terminator (highly recommended): This classic sci-fi film is definitely campy, but it’s what spawned an epic saga and really launched the career of one Arnold Schwarzenegger. It’s less about the action and more about the post-apocalyptic end-of-the-world attitude. Young Frankenstein (highly recommended): This is one of Mel Brooks’ best films, featuring exceptionally funny performances from Gene Wilder, Madeline Kahn, and especially Marty Feldman. One of the funniest movies and strongest parodies I’ve ever seen.